Radical environmentalist Derrick Jensen claims the tragedy of the commons is used as propaganda for private ownership. He says it has been used by the political right wing to hasten the final enclosure of the "common resources" of third world and indigenous people worldwide, as a part of the Washington Consensus. He argues that in true situations, those who abuse the commons would have been warned to desist and if they failed would have punitive sanctions against them. He says that rather than being called "The Tragedy of the Commons", it should be called "the Tragedy of the Failure of the Commons". 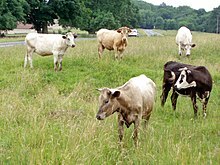 Marxist geographer David Harvey has a similar criticism, noting that "The dispossession of indigenous populations in North America by 'productive' colonists, for instance, was justified because indigenous populations did not produce value", and asks generally: "Why, for instance, do we not focus in Hardin's metaphor on the individual ownership of the cattle rather than on the pasture as a common?" This page was last edited on 23 April 2019, at 00:58 (UTC).